The first annual East Harriet Neighborhood Block Party and Annual Meeting took place on Saturday, October 5 from noon to 5 pm. The fall weather turned out better than expected despite the threat of rain with blue skies appearing for part of the day and light showers held out until mid afternoon. The annual meeting began at noon with year-to-date reports from the four committee chairs, an update on the 40th & Lyndale Ave Project from Council Member Tuthill, followed by board elections. The party began at 1 pm. We had an excellent turn out from the candidates running for mayor, ward 10 & 13, and the Park Board. MSP FairSkies set up tent with poster pictures taking questions and listening to concerns from residents on the airport noise. House of Hunger Food Truck had a continuous line serving up their famous philly cheese sandwiches, zucchini fries and home made chocolate addiction cake. Beer was served by Bryant Lake Bowl employees and beARTrageous Children's Art Studio was a popular kid's destination with face painting and an art creation station.7 The bouncy house never stopped bouncing and the kids had fun trying their hand at the bean bag & ring toss or hitting a hole in one on a mini golf green. EHFNA is already looking forward to planning their 2nd annual Neighborhood Party in 2014! East Harriet Farmstead Neighborhood Association is planning it's first neighborhood get together Saturday, October 5 from noon to 5 pm. 41st St from Lyndale to Bryant will be blocked off for a Neighborhood Block Party and Annual Meeting. The annual meeting will begin at noon with East Harriet updates and board elections. One free drink ticket will be distributed to East Harriet residents (adults only) when they sign in at the beginning of the meeting. The ticket can be used for a beer or a beverage from the food truck. Stick around after the meeting for a fun, fall afternoon of food, drink, games, information and visiting with local candidates! Great Food and beverages including beer will be available to purchase throughout the day. All other other events are free! The Twisted Sister House of Hunger Food Truck will be setting up at at noon serving a variety of food all day including Phillies and cheesesteaks, several kinds of hotdogs, and their own brand of tacos. You can have fries, or mac and cheese bites on the side topped off with chocolate addition cake! Staff from the local Southwest Minneapolis restaurant group, including Bryant Bowl, Barbette's, Gigi's, Bread & Pickle, and Pat's Tap will be selling beer. beARTrageous, a local children's art studio will be onsite doing facepainting and an autumn creation station for the kids from 1 - 5 pm. Kid's games and a bouncy house will also be set up for the kid's entertainment. MSP FairSkies will be on hand to answer your questions and discuss your concerns about the MSP flight pattern changes affecting the Southwest Minneapolis neighborhoods. Several Mayoral, Ward 10 & 13 and Park Board candidates will be represented and have tables at the block party, available to answer questions about their campaigns. 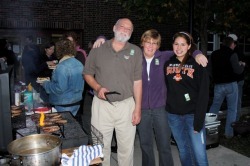 The East Harriet Annual Meeting took place October 3 on one of the last warm fall evenings with music by Bob Frey and brats grilled and served by Brian Nalezny. Susan Gray assembled and created a slideshow of 2011 events, programs and projects in East Harriet, followed by elections and a few words from Ward 10 Council Member Meg Tuthill and Hennepin County Commissioner Gail Dorfman. A special thanks to Bob Frey for providing the music, Principal Patrick Duffy, and his staff, Rick Sandin of Barton Open School for assisting with set up, take down and the use of their facility. East Harriet Farmstead Neighbor Association (EHFNA), elected four new and three returning members to the 2011-2012 board at the annual meeting on Wednesday, October 25, 2011. Newly elected board members are Emily Chow, Jon Marquet, Kristina Hughes and Tumay Kojasoy. Board members returning for a second two year term are Zach Mullinax, Susan Gray, and Adam Faitek. Linda Bormann and Brian Nalezny, currently serving two year terms round out the nine member board. 2011-2012 Board Officers will be posted the first week of November. East Harriet residents came together on a warm fall evening to celebrate their neighborhood vitality on a warm fall evening. 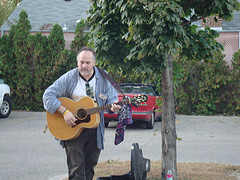 Neighbors were serenaded by Bob Frey on guitar while enjoying brats and hotdogs served off the grill. The event on October 5 was held at Barton Open School. The group moved inside to view a slideshow of events, programs and projects in East Harriet during 2011. Board elections were followed by words from Ward 13 Council Member Betsy Hodges, Hennepin County Commissioner Gail Dorfman, State Representative Frank Hornstein and Minneapolis Park and Recreation Board Commissioner Brad Bourn. East Harriet residents were treated to brats and rootbeer and the music of folk singer - songwriter, Bob Frey at the neighborhood annual meeting on October 6. The meeting began with the viewing of "East Harriet 2010 - A Year in Review", created by residents Pam Meier and Steven John Olson. Annual business followed with election of five new board members. Following the elections, residents heard from Hennepin County Commissioner Gail Dorfman, State Representative Frank Hornstein, Leslie Forman - Aide to Council Member Meg Tuthill, and Kristen Schott from U.S. congressman Keith Ellison's office. The meeting ended with awarding the winners of the dessert bake off drawing. Thanks to all who brough delicious desserts to share with their neighbors. A special thanks to Principle Steven DeLapp and his staff, Dave Eskew, Heather Bivens and Jay Luebber of Barton Open School for assisting with set up and take down, media and sound systems and the use of their facility. The October 7, 2009 EHFNA Annual Meeting kicked off with East Harriet residents enjoying the last of the warm fall evenings by feasting on brats, pretzels and rootbeer floats while socializing with their neighbors and board members and being serenaded by Graham Earley on his guitar. The meeting, held in the auditorium of the Barton Open School, began with a viewing of EHFNA, A Year in Review, a movie created by Emily Winters, Susan Gray and Steven John Olson. Annual business followed with the election of three new board members, Susan Gray, Zach Mullinax and Donovan Hart and adoption of a new business facade improvement strategy to our neighborhood organization's NRP Phase II Action Plan. With the conclusion of the annual business, those in attendance heard from a group of prominent featured speakers; Lyndale Community School Principal Ossie Brooks James, Council Members Ralph Remington and Betsy Hodges, Hennepin County Commissioner Gail Dorfman, State Senator Scott Dibble, State Representative Frank Hornstein, and Brian Elliot from U.S. Congressman Keith Ellison's office.